The Russian Studies program is a tightly-knit, supportive community of faculty and students. We get together regularly throughout the school year, with a wide range of events and opportunities to speak, watch, listen and interact with Russian language and culture. Russian Night: For over 25 years, the Department has hosted and organized an annual night that celebrates Russian culture. 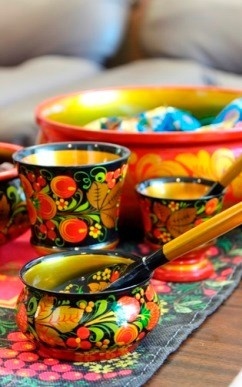 It's an evening of performance that includes choirs, song, plays, stories and culminates in a traditional Russian meal. Poetry readings: We recite our favourite Russian Poetry to one another at impromtu gatherings at student or faculty home. We serve wine, cheese and sit by a fire in comfy chairs. Russian Cooking Club: Students meet monthly to try out traditional Russian recipes together. Conversation club: Students get together to practice spoken Russian. Lunch and learn: Eat Russian dishes and listen to speakers discuss all aspects of Russian culture from rock music to opera, from art and Khruschev to feminism in late imperial Russia. Cine-eye Film Club: Every month we screen movies in the department. Popcorn and soft drinks included! The Dalhousie Russian Choir: The choir rehearses traditional Russian pieces that range from old hymns to twentieth centory folk songs. We meet every Wednesday evening and perform at the Russian Night festivities. Blini Lunch: during Maslenitsa, Russian pancake week, we serve up free Russian blinis. 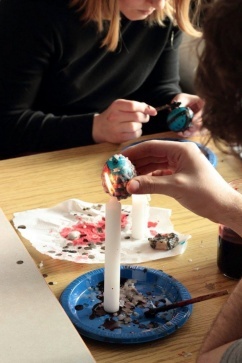 Ukrainian Easter Eggs workshop: Learn to make Ukranian Easter eggs. The Russian Student Society is an active student community that aims to enhance students’ experience through a wide-ranging variety of formal and informal occasions. Learn more about the society on the Dalhousie Student Union website.